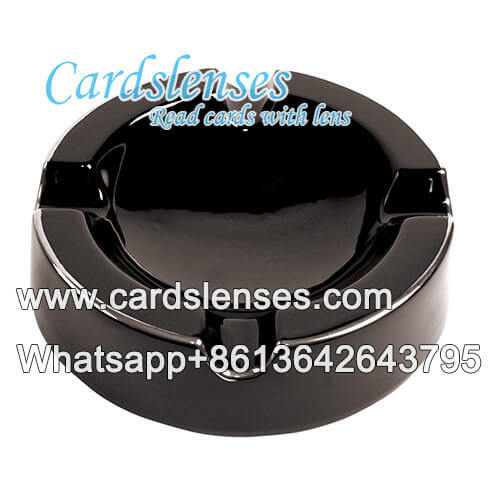 If you think it is inconvenient to take the ashtray with you, or you do not often playing in casino, our ashtray barcode cards reader maybe suitable for you. It is a real ashtray that we just build a barcode playing cards camera inside it. As long as you turn the scanning camera in the direction of the cheating edge barcode cards, it will scan the barcode and send the scanning image it scanned to the signal receiver in the poker predictor, and then, the poker predictor will analyze the image. In the end, you can obtain the cheating results by a couple of eavesdrop earpiece. If you have the specific ashtray to be built up the barcode cards scanner, you can tell us, we can buy it online. Or you can buy our ashtray scanner directly. The photo behind is the example.